Don't confound his regional state of the Zhou period with the empire of Chu 楚 (926-951), one of the Ten Kingdoms 十國 (902-979) of the Five Dynasties period 五代 (907-960). The state of Chu 楚 was a regional state of the Zhou period 周 (11th cent.-221 BCE). It belonged to the larger polities that were able to survive until the end of the Warring States period 戰國 (5th cent.-221 BCE). Chu is known for its culture that was significantly different from that of the states of the Central Plain. Chu was not among the states that were distributed as a regional states at the beginning of the Western Zhou period 西周 (11th cent.-770 BCE). Its ruling dynasty was of a different origin than most of the regional dynasties of the Zhou empire. Another name of Chu is Jing 荊. Chu was first located in the valley of the River Han 漢 and then moved southeast into the Yangtze Valley. During the Spring and Autumn period 春秋 (770 - 5th cent. BCE) it gradually expanded towards the north and east. Map according to Tan Qixiang 谭其骧 (1987), Zhongguo lishi ditu ji 中国历史地图集. Chu was located in the middle course of the Yangtze River and gradually expanded to the east and northeast. It played the role of temporary ally for the states of Qi and Qin, before the latter dominated over all regional states and founded the empire of Qin. Click to enlarge. The ruling house of Chu derived its descendancy from the mythical Emperor Zhuan Xu 顓頊, himself being a grandson of the Yellow Emperor 黃帝. Zhuan Xu's great-grandson Zhong Li 重黎 was the minister for fire (huo zheng 火正) of the mythical Emperor Di Ku 帝嚳. For his merits earned in office, Zhong Li was bestowed the name of Zhu Rong 祝融. He was sent out to punish the rebellious lord of the waters, Gong Gong 共工, but Zhu Rong/Zhong Li was unable to kill Gong Gong. Enraged about this failure, Emperor Di Ku executed Zhong Li and had his brother Wu Hui 吳回 take over the duties as minister of fire. Wu Hui had six grandsons that were called Kun Wu 昆吾, Shen Hu 參胡, Peng Zu 彭祖, Hui Ren 會人, Ji Lian 季連 and an unnamed son that was given the family name of Cao 曹. Five branches of the family fell into oblivion, except the descendants of Ji Lian who adopted the family name of Xiong 熊 or Mi 羋 (originally written 嬭). Excavated objects from the late Warring States period prove that the reigning dynasty of Chu also bore the family name Yan 酓. Mi Xiong allegedly took part in King Wu's 周武王 conquest of the Shang empire 商 (17th-11th cent. BCE). In the early decades of the Zhou period, King Cheng of Zhou 周成王 (r. 1116-1079 BCE) made the family Mi regional rulers over the country of Chu in the middle Yangtze valley. From that time on they adopted the family name Mi, yet the rulers retained the surname Xiong. Xiong might also be a prefix of the personal name worn by all members of the family. In the late 11th century King Zhao of Zhou 周昭王 undertook several military campaigns against Chu during one of which he died, while his own army drowned in the River Han. The rulers of Chu called themselves "king" (wang 王) and therefore demonstrated that they were actually not part of the system of regional states of the Zhou empire. Yu Xiong's great-grandson Xiong Yi 熊繹 settled near Mt. Jingshan 荊山 (modern Nanzhang 南漳, Hubei) and, after being appointed regional ruler (zhuhou 諸侯) by King Cheng of Zhou, moved to Danyang 丹陽 (modern Zigui 秭歸, Hubei). Viscount (zi 子) Xiong Qu 熊渠 became aware that the house of Zhou was weakening and expanded his rule along the middle Yangtze valley up into the valley of River Han. He conquered the statelets of Yong 庸 and Yangyue 揚粵. He made his oldest song Wukang 毋康 king of Goutan 句亶, his second son Zhihong 摯紅 king of E 鄂, and his youngest son Zhici 執疵 king of Yuezhang 越章. Later on he feared that the king of Zhou would attack him because of the usurpation of the title of king and stripped his sons off their ranks as kings. After the death of Viscount Xiong Shuang 熊霜 his three sons indeed contended for the throne of Chu. The youngest son, Jixun 季徇 (Xiong Xun 熊徇), was finally able to occupy the throne. When Fen Mao 蚡冒 (r. 758-741), also called Xiong Xun 熊眴, died, his younger brother Xiong Tong 熊通 assassinated the heir apparent and usurped the throne. He is posthumously called King Wu of Chu 楚武王 (r. 741-690) because he carried out numerous military campaigns, like that against the statelet of Sui 隨, whose marquis, hoping to escape defeat, offered to Xiong Tong to travel to the court of the King of Zhou to reconfirm Xiong Tong in his royal position, but the King of Zhou declined. Enraged about the King of Zhou's refusal, Xiong Tong decided to adopt the title of king without the permission by the Son of Heaven, concluded an alliance with the marquis of Sui and occupied the territory of the hundred Pu tribes 百濮 south of the Yangtze River. Xiong Tong later suspected the marquis of Sui of treason and planned to occupy his territory, but he died en route to the battlefield. His son Xiong Zi 熊貲 mounted the throne. Zi is posthumously known as King Wen 楚文王 (r. 690-677). He was the first ruler of Chu who took residence in Ying 郢 (near modern Shashi 沙市, Hubei) instead of Danyang. Xiong Zi conquered several small states, like Xi 息 (modern Xixian 息縣， Henan), Shen 申 (modern Nanyang 南陽, Henan) and Deng 鄧 (modern Xiangfan 襄樊, Hubei). His son Zhuang'ao 莊敖 (ao was a kind of temple name, like the Chinese zong 宗), known as Xiong Jian 熊囏 (also written 熊艱), planned to kill his brother Xiong Yun 熊惲 (also written 熊頵), but the latter escaped to Sui and gained sufficient support to usurp the throne of his brother. Xiong Yun is posthumously known as King Cheng 楚成王 (r. 672-626). Unlike his predecessors, King Cheng was a peaceful ruler who sent appropriate tributes to the court of the king of Zhou, so that he was ordered to appease the barbarian tribes of the south instead of harassing the states in the Yellow River plain. In 656 the hegemonial lord (ba 霸) Duke Huan of Qi 齊桓公 (r. 685-643) attacked Chu, but King Cheng was able to urge his troops to stop and concluded a peace alliance in the conference of Zhaoling 召陵 (modern Yancheng 郾城, Henan). In his later years King Cheng waged war against the statelets of Xu 許, Xian 弦 (near modern Xixian, Henan), Huang 黃 (modern Huanchuan 潢川, Henan) and Ying 英. Duke Xiang of Song 宋襄公 (r. 650-637), the new hegemonial lord, dispatched an envoy to Chu to offer a peaceful alliance, but the king refused and soon attacked Song 宋 and defeated the duke in the battle of Hong 泓 (modern Zhecheng 柘城, Henan) and also the state of Zheng 鄭. Duke Xiang died from a wound received during the battle. In 634 Duke Xi of Lu 魯僖公 (r. 659-627) arrived at the court of Chu and requested an army to punish the Duke of Qi 齊. King Cheng sent out the Marquis of Shen 申 who conquered the territory of Gu 穀, where Duke Huan's son Yong 雍 was instated as the local governor. The other sons of the Duke of Qi fled to Chu and were all made nobles in Chu. The statelet of Kui 夔 was conquered, and then King Cheng attacked the state of Song. The Duke of Song requested support by the army of Jin 晉. King Cheng thereupon withdrew because Duke Wen of Jin 晉文公 (r. 636-628), had been his exiled guest for a long time, and sent only out Ziyu 子玉 with a small contingent that was defeated. Against the advice of Prime Minister (lingyin 令尹) Zishang 子上, King Chen nominated his beloved son Shangchen 商臣 heir apparent. Later on he deposed Shangchen in favour to Zhi 職. Shangchen thereupon arrested King Cheng and forced him to commit suicide. He mounted the throne, posthumously called King Mu 楚穆王 (r. 626-614). His chief counsellor was Pan Chong 潘崇. King Mu conquered the statelets of Jiang 江 (modern Xixian, Henan) and Lu 六 (a special reading, modern Lu'an 六安, Anhui) and attacked the state of Chen 陳. He was succeeded by his son Lü 侶, who is posthumously known as King Zhuang 楚莊王 (r. 614-591). King Zhuang did not attend the court, indulged in pleasures and even ordered to execute those who dared remonstrating against him. Wu Ju 伍舉 thereupon used a riddle to admonish him, but without success. Only Su Cong 蘇從 was able to open the king's eyes so that he started caring for political matters again. During his campaign against the Rong barbarians 戎 of Luhun 陸渾, King Zhuang visited the capital of the kings of Zhou in Luoyang 洛陽 (modern Luoyang, Henan) and was received by royal grandson Man 王孫滿. The latter convinced him that the Heavenly Mandate (tianming 天命) of the Zhou dynasty had not yet ended, in spite of the obvious weakness of the royal house. In 597 Chu defeated the army of Jin near Bi 邲 (near modern Zhengzhou 鄭州, Henan). In 594 Chu besieged the capital of Song for five months and conquered the statelet of Yong 庸 (near modern Zhushan 竹山, Hubei), later Shu-Liao 舒蓼 (modern Shucheng 舒城, Anhui) and Xiao 蕭 (near modern Xuzhou 徐州, Jiangsu). After the conquest of Chen, King Zhuang wanted to transform it into a district of Chu, but Shen Shu 申叔 of Qi criticized the king, so that he reinstated the house of Chen. Yet his next step was to conquer the state of Zheng. After the lord of Zheng had begged for mercy, King Zhuang released him and created an alliance of peace. In 575 the army of Chu defeated the relieve army from Jin in the battle of Yanling 鄢陵 (modern Yanling, Henan). The rule of King Zhuang is seen as the apogee of the power of the state of Chu among the regional states of the Zhou period. He was accepted as hegemonial lord (ba 霸). King Zhuang was succeeded by his son Shen 審, posthumously known as King Gong 楚共王 (r. 591-560). During his reign the army of Chu was defeated by Jin. The next ruler was King Gong's son Zhao 招, posthumously known as King Kang 楚康王 (r. 560-545). The latter was succeeded by his son Yuan 員, who is also known as Jia'ao 郟敖 (r. 545-541). King Kang had four younger brothers called Wei 圍, Zibi 子比, Zixi 子晳 and Qiji 弃疾. Wei was made Prime Minister and commander of the army. When Jia'ao fell ill, Wei entered the palace, strangulated the king and killed his sons Mo 莫 and Pingxia 平夏. Zibi fled to Jin, while Wei mounted the throne. He is posthumously known as King Ling 楚靈王 (r. 541-529). King Ling was able to assemble the regional rulers and to take over the lead as a factual hegemon of the regional states. Minister Wu Ju warned the king to become over-confident in his superior role, yet King Ling commanded the regional states in a campaign against the state of Wu 吳. Qing Feng 慶封, the commander of the troops of Wu, was kept prisoner, but dared criticizing King Ling for the way his fathers had come to the throne of Chu, and was therefore immediately executed by the king. He had the Zhanghua Terrace 章華臺 built where he received noble refugees from other states. Prince Qiji was ordered to attack the state of Chen, and King Ling invited the marquis of Cai 蔡 in order to poison him. Prince Qiji conquered the headless state of Cai and usurped the throne of the small marquisate. In 530 BCE, King Ling attacked the small state of Xu 徐, located northwest of the state of Wu, and Lai 賴 (modern Suizhou 隨州, Hubei). Chen was heavily deafeated and its dynasty brought to an end. At that moment, King Ling deliberated with his nobles whether he was strong enough to claim the same rights as the other regional rulers. Grand master (dafu 大夫) Xi Fu 析父 answered that in old times, the state of Chu had been a very remote and less developed country, but now the King of Zhou would not refuse to bestow to the King of Chu bronze tripods as a symbol of royal power, and none of the other states would refuse to exchange gifts with the state of Chu. When King Ling was on campaign against Wu in the camp of Ganxi 乾溪, the king of Wu was advised by Guan Cong 觀從, a son of a noble of Cai whom King Ling had killed. The King of Wu joined a secret alliance with the state of Yue 越, whose nobleman Chang Shouguo 常壽過 had also been insulted by the king of Chu. Wu and Yue attacked Cai and won over Qiji, who was able to kill the heir apparent of Chu, Prince Lu 祿. Zibi was enthroned as king of Chu, Zixi was made Prime Minister, and Qiji Minister of War (sima 司馬). Guan Cong thereupon travelled to the camp of King Ling and presented him with the facts of the rebellion at home. The army of Chu dispersed and left the king alone. King Ling wandered around in the wilderness and finally died of hunger because the new ruler had forbidden giving him anything to eat. The new king, Zibi, was for a long time in an unclear state about the whereabouts of King Ling, and finally committed suicide, together with Zixi. Qiji renamed himself Xiong Ju 熊居 and proclaimed himself king of Chu. He is posthumously known as King Ping 楚平王 (r. 527-516). In fear of revenge, King Ping demonstrated a benevolent government towards the common people and restored the territories of the states of Chen and Cai, enthroning members of the former ruling houses. The eastern parts of Chu were plundered by the armies of Wu during this interlude of internal war in Chu. King Ping decided to marry his son, Crown Prince Jian 建, with a princess from Qin 秦. Yet the girl was so beautiful that the king decided to take her for himself, and she gave birth to Prince Zhen 軫. Grand Tutor (taifu 太傅) Wu She 伍奢 and Junior Tutor (shaofu 少傅) Fei Wuji 費無忌 intrigued against each other and instigated in the king the fear that the crown prince might prematurely usurp the throne. Prince Jian thereupon fled to the court of Song. Wu She's son Wu Zixu 伍子胥, who was an excellent strategist, was able to escape to the state of Wu, the arch-enemy of Chu. The mother of Prince Jian was captured by the army of Wu when Prince Guang 光 of Wu was campaigning against Chen and Cai. A small border clash in Beiliang 卑梁 lead to an armed conflict between Chu and Wu, in which Wu conquered the territories of Zhongli 鐘離 and Juchao 居巢. King Ping was so threatened that he began fortifying the capital city Ying. When King Ping died, the nobles wanted to enthrone his younger brother Prince Zixi 子西, but he refused, so that the under-age prince Zhen was enthroned as ruler of Chu. He is posthumously known as King Zhao 楚昭王 (r. 516-489). At the beginning of his reign, Prime Minister Zichang 子常 took revenge for Prince Jian and Wu She and killed the intriguer Fei Wuji. The reason for this was that a many nobles had fled to Wu, where they supported the troops of Chu against the own dynasty in Chu. Yet there were also some princes of Wu escaping trouble in the own country at the court of Chu. In 509 BCE the army of Chu, commanded by Prince Zichang, was heavily defeated by Wu in the battle of Baiju 柏舉 (modern Macheng 麻城, Hubei). Wu Zixu as one of the competent military leaders of Wu even managed to conquer the capital of Chu in 506. As a revenge for the execution of his father, Wu Zixu had the tomb of King Ping desecrated. Commander Prince Zichang fled to the state of Zheng. King Zhao himself escaped to Yunmeng 雲夢 and then on to the former state of Sui, where he was hidden by his loyal courtiers and the population from the army of Wu. In the meantime, minister Shen Baoxu 申鮑胥 was sent to the state of Qin to ask for relief troops, which were indeed able to defeat the troops of Wu that had advanced far into the country of the enemy until they reached Ji 稷 (modern Tongbai 桐柏, Henan). Prince Fugai 夫概, brother of the king of Wu, usurped the throne on this occasion but was driven out by the righteous king and fled to the court of Chu. Still on his way back to the capital, King Zhao of Chu swallowed the state of Tang 唐 (near modern Suizhou, Hubei), then Dun 頓 (modern Shangshui 商水, Henan) and Hu 胡 (modern Fuyang 阜陽, Anhui). There was another occasion in 504 when the army of Wu again invaded the state of Chu. Only with the death of King Helü 闔閭 of Wu (r. 514-496) the attention of Wu was directed against the state of Yue, and the danger from the east was gone. On his sickbed, King Zhao wanted to cede the throne to his younger brother, yet all nobles refused, before Prince Zilü 子閭 conceded to become the successor of his brother. Yet when the King died on a campaign, the brothers decided to enthrone the king's son, Prince Zhang 章. He is posthumously known as King Hui 楚惠王 (r. 489-432). In 488 Prince Zixi invited the former Prince Jian's son Prince Sheng 勝 to come back to Chu. He was granted the title of Duke Bai 白公. Duke Bai planned to revenge his father's death, who had been killed in exile in Zheng. In 481 BCE, the army of Jin attacked Zheng, and Zheng asked Chu for help. Instead of annihilating Zheng, commander Zixi left Zheng untouched. Duke Bai thereupon killed Zixi, Prince Ziqi 子綦 and Prime Minister Sima Ziqi 司馬子期 at the court and tried to kidnap King Hui. Yet the king was protected by his retainers and took refuge in the palace of the Queen Dowager of King Zhao. Duke Bai thereupon proclaimed himself king, but was assassinated by Prince Zigao 子高, called Duke Ye 葉公. In this year, Chu finally destroyed the state of Chen, in 447 the state of Cai, and in 445 the state of Qi 杞. In 473, the armies of Yue had finally destroyed the state of Wu. In the northern parts of Wu, along the plain of the River Huai 淮, Chu began to expand its territory. King Hui was succeeded by his son Prince Zhong 中, who is posthumously known was King Jian 楚簡王 (r. 432-408). Under his reign, Chu conquered the statelet of Ju 莒 (modern Juxian 莒縣, Shandong) that had belonged to the territory of Qi. King Jian employed the famous military advisor Wu Qi 吳起, who reformed the army, so that Chu was able to conquer the southern regions inhabited by the non-Chinese peoples of the Yangyue 揚粵, namely the Dongting 洞庭 (Hunan) and Cangwu 蒼梧 (Guizhou) regions. King Jian was succeeded by his son Prince Dang 當, posthumously known as King Sheng 楚聲王 (r. 408-402). King Sheng was killed by "robbers" (presumably nobles or family members) and was succeeded by his son Prince Yi 疑, posthumously known as King Dao 楚悼王 (r. 402-381). Under his reign, Chu contended with the troops of the new states of Han 韓, Zhao 趙 and Wei 魏, the successor states of Jin. King Dao was succeeded by his son Prince Zang 臧, posthumously known as King Su 楚肅王 (r. 381-370). Because King Su had no sons, he left the throne to his younger brother Prince Liangfu 良夫, who is posthumously known as King Xuan 楚宣王 (r. 370-340). At the end of the latter's reign, the armies of Qin attacked Chu. At that time, Qin was governed by counsellor Shang Yang 商鞅. King Xuan's son Prince Shang 商 succeeded to the throne in Chu, posthumously known as King Wei 楚威王 (r. 340-329). He was able to defeat the armies of the state of Qi, which was at that time disturbed by inner quarrels. King Wei also defeated the armies of the kingdom of Yue and occupied a large part of its territory, so that Chu was now the sole state in the southern parts of China. In 306, Yue was destroyed by Chu. When King Wei died, the state of Wei used this opportunity and conquered part of its northern territory. King Wei's successor was his son Prince Guai 槐, posthumously known as King Huai 楚懷王 (r. 329-299). 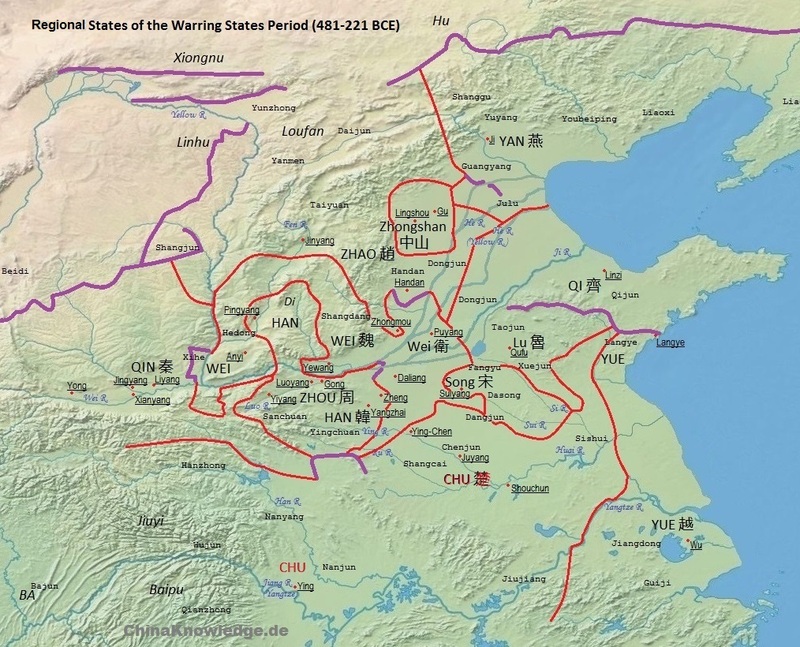 In 323 BCE he took revenge and attacked the territory of Wei, seizing eight counties. The next military target was the state of Qi, yet at that time the military adviser Chen Zhen 陳軫 dwelled at the court of Qi and was dispatched to the camp of counsellor Zhao Yang 昭陽, highest commander of the army of Chu. Chen Zhen persuaded Zhao Yang with the parable of drawing feet to a snake that he would have no advantage in defeating the army of Qi, so that Zhao Yang withdrew. At least, Chu was able to conclude an alliance with the states of Qin, Wei and Qi that was initiated by the famous diplomatist Zhang Yi 張儀. This alliance became important in 318 BCE, when an alliance, concluded with the help of Su Qin 蘇秦, attacked the state of Qin. King Huai took over the lead of the allies and penetrated into the Hangu Pass 函谷關, yet the allies withdrew without forcing Qin to battle. In 313, things had changed and Chu was in alliance with Qi. The king of Qin decided to send Zhang Yi to Chu in order to persuade King Huai to change side again and, in the end, to isolate Chu. Chen Zhen was well aware of this and warned King Huai, but he refused to accept the warning. In the end, the enraged king of Qi concluded an alliance with Qin. King Huai, on his side, made ready the troops for a campaign against Qin. Again, Chen Zhen warned the king and suggested offering Qin a city to restore the former alliance. King Huai ignored the warning, and so the army of Qin destroyed that of Chu at Danyang 丹陽 in 312, captured a huge humber of troops and officers, and occupied the region of Hanzhong 漢中. At Lantian 藍田, the armies battled a second time, and the fresh defeat of Chu instigated Han and Wei to seize some more territory from Chu. A year later, Qin suggested concluding peace and sent Zhang Yi to the court of Chu. King Huai immediately arrested Zhang Yi and planned to kill him, but Zhang established contact with Qin Shang 靳尚, who explained to King Huai that Qin would attack Chu again. He also spoke with the King's favourite, Lady Zheng Xiu 鄭袖, and threatened her that the king of Qin would try to purchase peace by sending beautiful girls to King Huai. The Lady then managed the release of Zhang Yi, and peace was made with Qin. Shortly after, the Chu embassador to Qi returned, Qu Yuan 屈原, and reproached the king for not having executed Zhang Yi. In 310 BCE, the King Min of Qi 齊湣王 (r. 324-284) sent an envoy to the court of Chu and explained that, after the death of King Hui in Qin, the situation had changed thoroughly, and suggested to conclude a common alliance with Han, Wei, Zhao and Yan 燕 against Qin. Zhao Ju 昭雎 convinced King Huai that it was better to be part of the alliance around Qi and to win back the territory once lost to Qin. Yet in 307, King Huai decided that he could also win territory by concluding a peaceful alliance with Qin. Two years later Qin, Han and Wei attacked Chu for its betrayal of the alliance. King Huai sent his crown prince as a hostage to Qin and requested military support against the three states. In 304, the crown prince of Chu had a private quarrel with some nobles of Qin. When he accidentally killed one of them, he fled and returned to Chu. In order to take revenge for the murder, Qin attacked Chu, supported by troops of Qi, Han and Wei, and defeated Chu at Chuisha 垂沙. A year later, Qin undertook a second campaign against Chu and heavily defeated the army of Chu. King Huai thereupon sent his crown prince as a hostage to Qi, an ally of Qin, and requested peace. Only after a further campaign and after King Zhao of Qin had sent an urgent letter, King Huai of Chu consented to a meeting with the king of Qin at the Wuguan Pass 武關. Yet King Huai did not trust Qin and feared that he might be caught in a trap. Zhao Ju suggested not to meet the king of Qin, but the King's younger son urged him to go. In the end, King Huai was escorted to Xianyang 咸陽, the capital of Qin, and was threatened to cease territory before concluding an alliance. He refused and was arrested and detained. At home, the situation was precarious. Both the king and the crown prince were held hostages in Qin, and Zhao Ju argued that it was against etiquette to enthrone a younger son as long as the ruler was living. This meant that there was no head of government as long as King Huai was in Qin. The court brooded over the issue and finally invited Prince Heng 橫 to come to the capital Ying. He was enthroned as king of Ch, posthumously known as King Qingxiang 楚頃襄王 (r. 299-263). The king of Qin thereupon continued his campaigning against Chu, defeated its army, and seized territory in the north. A year later, King Huai managed to escape, but because the roads to Chu were blocked by Qin, he fled to the state of Zhao, but fearing the anger of Qin, King Huiwen of Zhao 趙惠文王 (r. 299-266) refused to offer protection. King Huai was finally captured by the bloodhounds of Qin and brought back to Xianyang, where he died a year later. At least, his corpse was allowed to be transferred back to his native state, where he was buried with greatest honours. In 293 BCE, general Bai Qi 白起 massacred the army of Han. Threatened by this cruel way of warfare, King Qingxiang agreed to conclude a marriage of peace with Qin. This new alliance led to a campaign in 284, carried out by Qin, Chu, Han, Wei, Zhao and Yan and targeted against the state of Qi in the east. Chu so regained the region of Huaibei 淮北. In 281, King Qingxiang was persuaded to resume war against Qin, in order to gain more territory. He first concluded an alliance with Qin and Han and planned to use this opportunity to conquer some territory of the patriarchal kings of Zhou around Luoyang. King Nan of Zhou 周王赧 (r. 315-256) thereupon sent his relative, Duke Wu 武公, to Zhaozi 昭子, the counsellor of Chu. Duke Wu explained to Zhaozi that the destruction of the house of Zhou meant a thorough dissolution of the world order and would bring only chaos to the state of Chu. King Qingxiang thereupon abandoned this plan. The campaigns against Qin continued, but in 278 BCE, general Bai Qi advanced to the capital of Chu and defiled the tombs of the kings of Chu. The capital of Chu was moved to the ancient site of Chen (modern Huaiyang 淮陽, Henan) It was only in 276 that the army of Chu was able to recover some of its core territory. Chu was even able to supporte Han, Zhao and Wei in a campaign against Yan. This was only possible because of an armistice bargained with Qin, covered by the crown prince as a hostage dwelling in Qin. When King Qingxiang fell ill, his son Prince Xiong Yuan 熊元 (or Wan 完) managed to escape from Qin and was enthroned as the new king of Chu. He is posthumously known as King Kaolie 楚考烈王 (r. 263-238). The new king immediately appointed his trusted Counsellor-to-the-Left (zuoxi 左徒), Lord Chunshen 春申君, as Prime Minister. Under the Lord's administration, the state of Chu was able to recover for a while. The capital was first shifted to Juyang 巨陽 (modern Taihe 太和, Anhui), later to to Shouchun 壽春 (modern Shouxian 壽縣, Anhui) further to the east. Lord Chunshen met with Lord Xinling 信陵君 of Wei and forged an alliance that was able to defeat Qin in 257. A year later, Chu conquered the state of Lu. King Kaolie was succeeded by his son Prince Dao 悍 (or Yu 煜), who is posthumously known as King You 楚幽王 (r. 238-228). Li Yuan 李園, a powerful noble, used this personal change to assassinate Lord Chunshen. King You was succeeded by his younger half-brother You 猶 (or Hao 郝), who is posthumously known as King Ai 楚哀王 (r. 228). He only ruled for two months before he was overthrown and killed by his older half-brother Fuchu 負芻 (r. 228-223). The rule of the last kings of Chu was overshadowed by a growing military success of the state of Qin that succeedingly conquered the states of Han, Zhao and Wei. In 224, the Qin general Wang Jian 王翦 defeated the army of Chu and killed general Xiang Yan 項燕, a great uncle of Xiang Yu 項羽, the eventual hegemonial king (bawang 霸王) of West Chu 西楚. A year later, Wang Jian and Meng Wu 蒙武 seized the capital of Chu, captured King Fuchu and transformed the state of Chu into a commandery of the state of Qin. The name of Chu was often used as a name for imperial princedoms, and was one of the Ten States (Shiguo 十國) in the 10th century. 223 Chu destroyed by Qin 秦.
Shiji 史記, 40, Chu shijia 楚世家. Li Ling 李零 (1992). "Chu 楚", in Zhongguo da baike quanshu 中國大百科全書, Zhongguo lishi 中國歷史 (Beijing/Shanghai: Zhongguo da baike quanshu chubanshe), Vol. 1, 109-110.